Much like Basalt Monolith, also from Alpha, Mana Vault initially reads as something harmless. It might even read as something pointless, because it costs more to untap it than it generates. The first clue that things are otherwise is in its mana cost. The difference between one and three is a lot more than two, and there are some situations where you don’t actually need to untap it because you’ve cast something huge on turn two. The other shoe didn’t quite drop for a few months, until Antiquities came out and gave us Power Artifact, a combo that generates infinite mana in combination with either Mana Vault or Basalt Monolith. It’s fragile, but the times you’ll pull out a hundred-thousand-point Fireball make up for it; Old School players have discovered ways to fit it into a control deck, too, which helps shore up some of its vulnerability to the ubiquitous Disenchant. 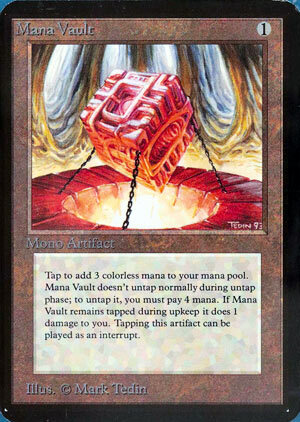 Mana Vault is an artifact that makes even more mana, and that means it combos extremely well with things that untap artifacts or help them to untap. Power Artifact, Voltaic Key, Unwinding Clock…all of these help Mana Vault untap faster and let you take advantage of all of the mana it can produce. A Commander staple for good reason…and banned from Legacy/restricted in Vintage for good reason as well, as being able to churn out degenerate amounts of mana is not something you would want to allow in a tournament format. It’s not ideal on its own (as it will slowly kill you if you use it, and it doesn’t untap normally), but jumping from 1 mana to 5 mana (at least) is a good place to be, right?